There are a number of things about the Muscovy that make it unique among the ducks in the APA Standard. Its appearance, especially the fleshy caruncles around its eyes make it stand out when compared to the other ducks in the Standard. The significant difference in size between males and females is unusual. The fact is that it is the only duck in the APA Standard which is not descended from the Mallard. It is actually in the Shelduck family and its closest relative in the Standard is the Egyptian Goose. Even its name is unusual. At the time that many of the breeds of waterfowl were being standardized, it was considered important to maximize their commercial potential by making them seem more exotic than they actually were. Thus the Muscovy‘s name suggests Russian heritage even though it actually came from Central and South America where it can still be found in the wild today. As far as I am concerned, the Muscovy is the ideal meat duck. It can earn much of its own living when given a chance to forage. In size, it can dress out larger than all of the ducks and only the large geese rival it in that regard. While it is true that the Muscovy matures at a relatively slow rate, its ability to gather so much of its own living and its excellence as a parent make it an ideal farm duck. I know of at least one top breeder of Muscovys who almost never hatches them in his incubator. He says that he gets the best hatches when he allows the females to incubate their own eggs. In many markets, there is a premium paid for Muscovy meat so culls are still valuable. The APA Standard needs an update when it comes to Muscovy weights. Males of several years of age in particular of good exhibition strains will far exceed the 12 lb. weight that the Standard presently calls for. Personally, I would much rather see the weights changed from static weights to a range of weight as is done in the U.K Standard. Anyone familiar with waterfowl, in general, realizes that a given bird (at least in the large breeds of ducks or geese) can gain or lose as much as 20% of its weight depending on the time of year. Today, the Muscovy can be found in a range of Standard and non- Standard colors as well as the original White and Black varieties. One can find Muscovys in Blue, Chocolate, and Lilac colors among others. In most cases, the colors are pure and the overall quality of the birds is good. The caruncling on the faces of both sexes is not only a unique characteristic but today, it can be a source of some concern. The caruncling seems to grow in the male in particular for at least the first several years of its life and the caruncling over the eyes can develop to the point where eyesight is affected. No Standard feature should ever be allowed to be overdone to the point where the bird’s ability to see, walk, or mate is impaired. The same should be true of birds which are so large in size that they cannot function normally. It would follow then that birds with overdeveloped caruncling or so large in size that mating cannot be accomplished are more fit for the table than the breeding pen. No breed of fowl should have to depend on artificial breeding due to our follies as breeders. 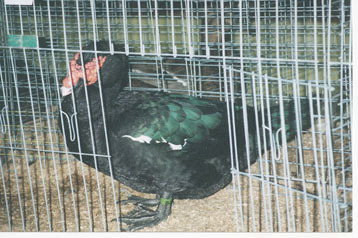 The Muscovy can be somewhat of a challenge to fit for shows due to the fact that their plumage (especially the White and other light colors) is vulnerable to staining if the birds are not kept in clean conditions. Their plumage is not as water repellent as that of other breeds of waterfowl so once stained, it can be almost impossible to get clean. It is wise, therefore, not to overcrowd Muscovys and to eliminate mud and muddy puddles in their yards. Muscovys tend to be prone to picking up E. Coli infections from muddy puddles so when I raised them, I put down a layer of sand in their pens. E Coli problems then ceased. From my observations, there are several lines of exhibition Muscovys that have been brought to a high level of excellence. Now it is up to those breeders and those who judge them to see that excesses are not permitted to become prevalent.